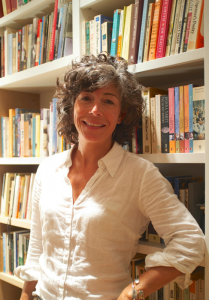 Today I am pleased to welcome Henriette Lazaridis Power to Historical Tapestry as part of her blog tour with TLC Booktours. The tour will be visiting us again in a couple of weeks when I will be reviewing the book. 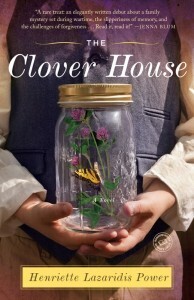 Henriette's book, The Clover House, is set in Greece during WWII. I can't tell you how thrilled I am that Henriette has chosen to share not only her passion for photography but also the photos that her father took that she references throughout the post! Welcome Henriette and thank you for sharing. One of my favorite experiences with my father came in the summer of 1974 when he and I were on our way to Greece for our yearly visit to family. Instead of flying directly to join my mother in Athens, we began in London and took a combination of trains and cars to reach Rome, flying the final leg from there across the Adriatic. Like many fourteen-year-olds, I had no particular desire to spend time with my father--or with either parent, really--but he and I had a good trip. And the reason for it was photography. That summer, I had had my first non-babysitting job, as a camp counselor. Feeling flush with the lump-sum salary payment rather than the small instalments I got at my babysitting rate, I bought one object to mark my entry into the ranks of the gainfully though seasonally employed: a Canon FTb with the basic 35mm lens. There was nothing refined about the FTb. It seemed to have been carved from a solid block of metal, adorned with only the most essential knobs and dials. Shutter speed. Aperture. ASA. And a fold-out crank to rewind the film. The lens was among the sharpest I have ever known, and its aperture ring turned with a satisfying soft click. As for the shutter, that resounded like a rifle shot. Though simple like the Leica, the FTb lacked the subtlety and stealth of its German counterpart. But I loved my FTb, and I still do. I love that it has a dent on its upper-right-hand corner from some tumble from a backpack after college. And I love that its base is adorned with a Dymo label bearing my name. Henriette Lazaridis. The camera has known me and I it since before I became an adult. These days, I pull the FTb off the shelf on a regular basis, choosing it over my newer, digital cameras. And here’s why. The FTb fits my hands perfectly, and when I look through the lens, I know immediately whether my exposure will be right. Not because of any numbers or green or red lights, but because of a thin wand and a circle. When they intersect, my exposure is good. Like all brilliant systems, this one is intuitive and simple. It makes me happy just to use it. And when I see the results, I’m happy again to see the clear contrast in the black and white film I favor and the sharp focus of the image. But more than that, when I press the shutter, I have a kind of combined muscle and heart memory of my father--a memory I treasure. Shooting with the FTb connects me to him and to that summer when he taught me the lessons I think of still. He would stand by me as I took a photo, ask me how I’d framed it, and then explain how I could have made it better. In Montmartre, at the Duomo, or the Colosseum, he let me make my mistakes and then gently showed me how to fix them. Under his tutelage, my successes were all my own. Photography was an important part of my father’s life. As a young man in Greece, he taught himself about exposures, film, and filters by reading German technical manuals, and by staging elaborate light experiments with his friends. He labeled most of his prints on the back with the aperture, speed, filter, and film he had used, all in neat roman-alphabet hand. I have his photographs in boxes and albums and envelopes now. Each stiff-paper print is a record of his attempt to perfect his craft. Together, the images form a record of life during a time of great upheaval. One of my prized prints among the many I have from my father is the one from 1942 that shows a group of three boys in shorts and sandals. 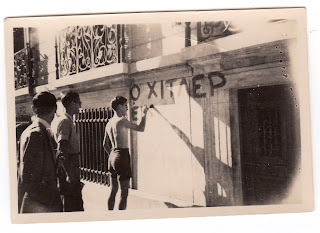 One of them is painting a slogan on a wall while the others watch. The slogan reads “Hitler is a”. To paint those words was a dangerous act. To photograph them almost as dangerous. 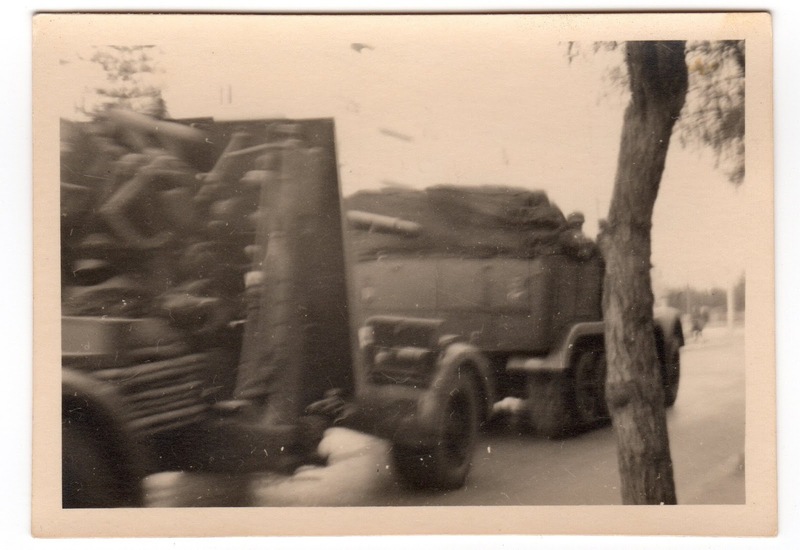 Other photos my father took show German tanks rolling through the streets of Athens in April of 1941, taken from inside his jacket to keep him from being hauled off by the invading army. 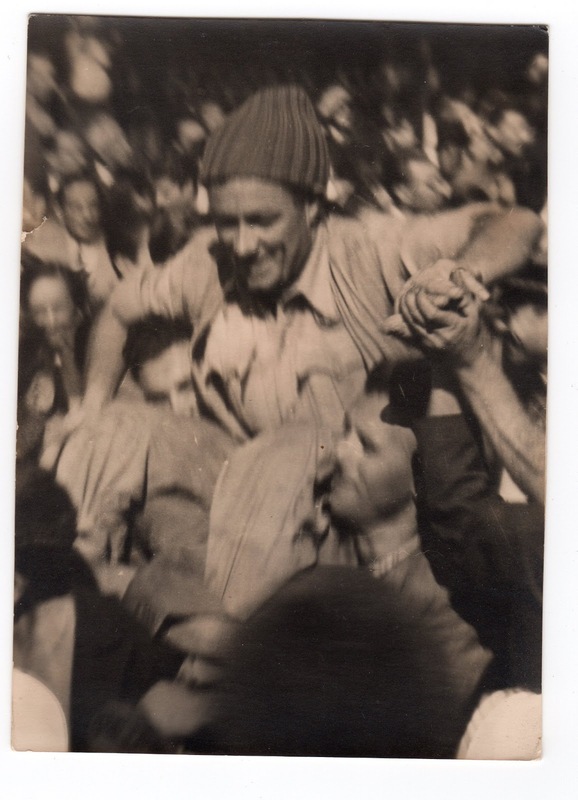 And finally, there is the blurry, tilted shot of a paratrooper on the shoulders of jubilant Greeks. My father was there when the first British paratroopers landed to liberate Athens. As he would do the rest of his life, he had shouldered his camera and marched into drama, or chaos, or trouble, not away from it. Throughout my childhood, I leafed through these photos, trying to imagine what it was like to live in a city under foreign occupation. Eventually, I would study these prints to understand how he had come to achieve the contrast, the composition, the light. But first and foremost, my father’s photographs were a window onto a life I wanted to capture in some way. 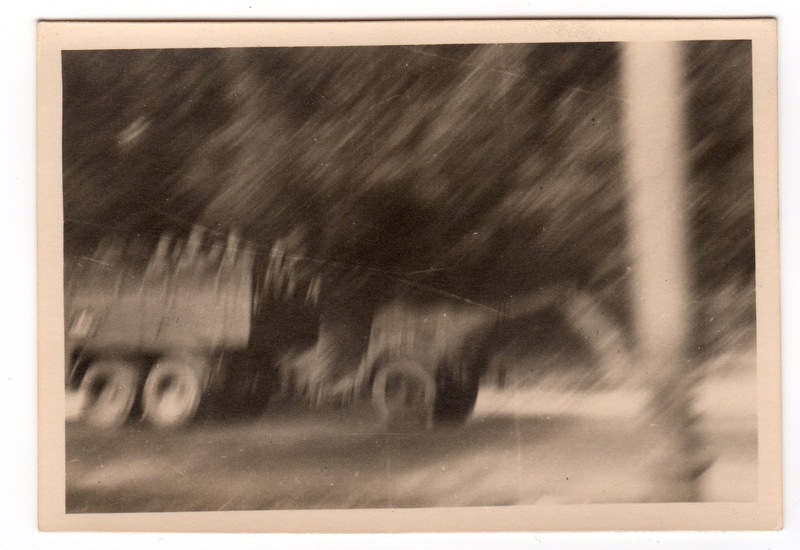 My mother’s photographs, too, gave me a view into the past. While my father was the photographer, my mother was the subject, along with her cousins and her brother. Images from her collection showed her and the other children during childhood and youth in the city of Patras, in the midst of various adventures--skiing, hiking, riding bicycles, swimming or diving--or playing in the fields around their family farm. As an only child, I consider it my obligation to hold the information behind all these photographs and to pass it on to my children, so that they can recognize the relatives whose faces swim up at them from the black and whites that are part of their heritage. Photography, too, is part of their heritage. When my son marches off into a foreign city and brings back images caught from close up, without timidity and with the keen perception of the street photographer; or when my daughter stops to capture the vivid colors of a fleeting moment--then I know that my children have inherited their grandfather’s gift. And by gift, I don’t even mean talent, but the simple fact that he gave them, as he did me, this way of investigating the world. 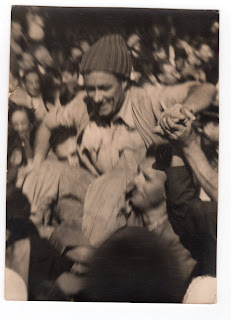 When I sat down to write The Clover House, about a young woman’s search for the truth behind her mother’s experiences in wartime Greece, these were the images I dug through, both in boxes and in my memory. But it’s more than just this particular narrative that derives from my love of photography. I actually think of narrative in the first place as essentially photographic. I tend to see a novel as a series of pictures. Scenes or episodes are, for me, visual moments, like snapshots glimpsed one after the other. As I write, I picture the moment first, and then I more or less write what I see. When I revise, I often turn to film for guidance, looking to the structure of a movie as a model for my work, or taking the camera’s movement in a film as a parallel for the point of view I want the writing to adopt. Recently, as I revised another novel manuscript, I wrestled with the idea of changing the point of view. I couldn’t figure out what would work best--close third person? omniscient?--until I remembered a scene from Joe Wright’s Atonement. I took the movement of his camera as the model for my narrator’s stance. It doesn’t surprise me that I turned for narrative inspiration not to McEwan’s novel, which I admire intensely, but to Wright’s film. I envy the screenwriters. I think my ideal way to write a novel would be to find some way to shoot photographs to represent each moment in the story. Then I would array these photographs on the floor and arrange them to form the narrative arc I needed. And from there, I would write the novel, creating in words the imagined photography exhibit of my invented world. The truth is that I’ve adopted a revision habit that enables me to do the next best thing. Once a manuscript is complete, I write the scenes on index cards, one by one. I force myself to write just the bare minimum of information on each card, to make them quick glimpses of the story, like backyards observed from a train. I spread the cards around on the floor or on a big table, rearranging until I have the right narrative sequence. These index cards are my photographs now, I suppose. They give me a way to return to the tactile, physical, loud-clicking, shutter-snapping world of my FTb and photography, where I first learned to tell a story. This is fabulous! I also bought a camera with my first 'real' job funds. It is still in my collection and I resisted for years moving to digital. The camera represents much for me and I can't imagine ever really parting with it... I also prefer black and white film and was thinking just today that I should get a roll. :) I don't have quite the same backstory, though. To be honest, no one in my family is much of a photography freak unless they are capturing family moments. I am not sure where I got my interest... I wish it held such a special spot for me... Not that I regret my interest at all, of course! Thanks for posting at HT! I too love looking through old photos, especially those belonging to my grandma ... I learn so many wonderful things when I discuss them with her. Thanks for featuring Henriette's post for the tour! Heather, I'm with you--as you can tell from this post. I think we always discover new things about our families and ourselves when we dig through old photos. Kailana, so glad you liked the essay. The good thing about photography is that the camera can't tell whether you have a legacy of photography in your family! All that matters is that you're using the camera to capture your vision of the world around you. I hope you find a roll (or two, or three) of black and white soon. Thanks for reading.